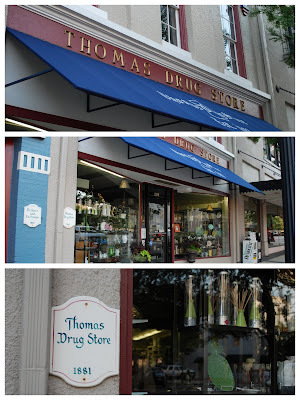 The pictures are of the pharmacy that I use here in my little quaint town, and I love it. I love the building, the pharmacist, the ladies who work up front, in the back, at the sides and all around it. I love the fact that they know my name, and all my little ailments and quirks, I feel no embarrassment at all when I go in and tell them I'm out of happy pills can I please have some more!!!! The girls love to go in there with me and it's like when I was a kid, they have individually priced candies in front of the counter so the girls like to pick one and it's a little treat for them if they behave while we're in there. Have you been counting? I have used the word love a million times so far. This place just takes me back to good old fashioned values, taking time out to get to know people, there are no numbers, there are no lines and no hassles, it's just a pleasure to be there. On days when I am exceptionally busy or just can't get there they will deliver to me at home, at work, wherever I happen to be, at no charge!!!! No Charge, ya hear me!!!! It's fantastical. When was the last time a big ole chain did that for anyone????? Also they have the bestest little cutesy gifts and they'll wrap them and deliver them for you.... also at NO CHARGE!!!!!! So if you remember when I told you about this, you'll see that I am fairly often in there self medicating, this is what brought me to do a post just for the lovely Bambi, she's a pharmacist and therefore now she's one of my BFF's (Bloggy Funny Friends). I love to go and read her Pharmacy Friday Posts, it's a hoot and an interactive one at that, just send her some questions and they don't even have to be about drugs, she's very informative in other areas too, like shoes and purses!!!!! Who knew!!!!! Well the wonderful people following her that's who!!!!!!! So my dearest dahling Bambi this one's for you.... I'm on my third teeny tiny glass of red... cheers missy and I can't wait to meet you in person in Sept here....... BC Reno! Bambi is my Pusher! She deals nothing but smiles! She's my fav pusher too. And she can count by 5! There are a couple of projects I have in mind too, Chardonnay and Cab!!! !